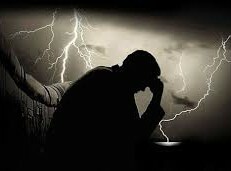 The pastor groans on Sunday night; the professional sighs on Monday morning; the defeated mother cries into her washing; the depressed father sobs into his pillow. Elijah had reached the same place. Weary from years of preaching a message that no one took seriously and worn from forever just barely scraping by, he had probably been on the verge of burn-out for awhile. But now fear pushed him over the brink. The man of God had plenty to be afraid of. The king was furious after three years of drought for which he held Elijah responsible. The queen had just issued a death-threat after he made a fool of her god and took down all of her prophets. But none of that was really new for Elijah. He had always lived on the edge, recklessly pursuing God’s call no matter what the cost. What eroded the last vestiges of his confidence was his fear of failure. God had entrusted him with the impossible task of turning His people’s hearts back to Him, and now after the cosmic showdown of the century, they still refused to repent. If all his sermons and warnings, even signs and wonders still didn’t convince them, what more would? Zeal for God’s name had worn Elijah out, but that was all it had been successful in doing. The angel of the LORD came back a second time and touched him and said, “Get up and eat, for the journey is too much for you.” So he got up and ate and drank. Strengthened by that food, he traveled forty days and forty nights until he reached Horeb, the mountain of God. There he went into a cave and spent the night. Elijah needed a place to regroup, to escape from constant responsibility and ever-present threats. He quite literally ran for his life until he reached the place where he would be sure to find God: Horeb, otherwise known as Sinai, had been where his ancestor Moses met God back-to-face. Surely here Elijah would receive some much-needed direction from God on how to deal with His stiff-necked, idolatrous people. And sure enough, God showed up. As He had done with the discouraged Moses, He invited Elijah to voice his complaint and engage Him in a back-and-forth conversation . Elijah’s presenting complaint detailed his frustrated efforts and the people’s persistent rejection of both God and himself. But hidden just under the surface was his respectfully concealed finger, pointing the blame at God for not making things any easier for him. After all, wasn’t Elijah simply trying to follow His orders? Why had God saddled him with such an impossibly difficult burden and then left him on his own to carry it? The weight of responsibility was crushing him to the point that he simply wanted to quit, even if death was the only way out. The LORD said, “Go out and stand on the mountain in the presence of the LORD, for the LORD is about to pass by.” Then a great and powerful wind tore the mountains apart and shattered the rocks before the LORD, but the LORD was not in the wind. After the wind there was an earthquake, but the LORD was not in the earthquake. After the earthquake came a fire, but the LORD was not in the fire. And after the fire came a gentle whisper.When Elijah heard it, he pulled his cloak over his face and went out and stood at the mouth of the cave. God’s initial response came not in a verbal defense, but through a series of tangible experiences that would challenge Elijah’s assumptions about Himself. Elijah’s ancestors had experienced Him here as the terrifying God who thundered from the top of the mountain, shattering rocks and billowing smoke until they couldn’t bear being near Him any more. In fear they had begged for a mediated relationship with Him, one in which the buffer of angelic messengers and a stone-encoded set of rules would protect them from being consumed by His fire. That approach to pleasing God is precisely what wears us out. But that approach to pleasing God was precisely what had worn Elijah out. No one could bear the burden of those impossibly heavy stone tablets on his own. No one could successfully fulfill God’s calling without His moment-by-moment support sustaining her from within. So God set about showing His servant a new way of relating to Him. His Spirit came not as the forceful wind but as a gentle breath; not as the overwhelming earthquake but as a confidence-restoring whisper; not as the fire that consumes and burns up but as one that consumes and fills. Such an intimate invitation coaxed Elijah out of his hiding place and into God’s presence. God’s question came again. What are you doing here? Why have you come back to this scary old mountain? This is the place where fear and distance define our relationship, where rules and performance stand between us. Go to the new mountain where I dwell with my people in intimacy and love, the place where you are neither alone in your struggle nor doomed in your mission. And this is the same invitation that rings down through the experiences of all who have encountered God in their fatigue. We turn back to Sinai in our performance-oriented relationship with God, shuddering under burdens that He never intended us to carry alone. He invites us forward into the easy yoke of His Spirit, in which His power works through us to accomplish the impossible. We’re climbing the wrong mountain. Of course we can’t go on like this anymore. We’re climbing the wrong mountain. “How dare you take your children to live in such a dangerous place! What about your calling to be a good father to them? How could you live with yourself if they died because of your decision to follow God?” The questions my brother was facing were identical to the ones I had asked myself years earlier as my husband and I prepared to move overseas. None of us had any doubt that God had called us to go and serve Him in these very challenging fields, but we all struggled to reconcile that calling with our other calling to nurture and protect our children. Which came first? …it is through Isaac that your offspring will be reckoned. Abraham had gone before us in facing this dilemma, and his response became the basis for our own. Everything that he had been promised, everything that he had staked his life on, hinged on the life of his only son. This was his miracle baby, the one they almost didn’t have. This was his last chance, the only child left after he had lost the other one. This was his Isaac, his long-awaited gift from God. Surely God wouldn’t demand him back. But the call was clear. God had told him to sacrifice Isaac. No one else had heard it, but he had. There was no denying what God had asked him to do, but it just didn’t make sense. The mental image of his beloved son, the promised child of the covenant, brutally slaughtered and engulfed in fire was too much to bear. Why would God raise his hopes for the future only to dash them? Why would He give this precious child only to take him away? Ultimately, the decision was Abraham’s. God had not struck Isaac dead. He had asked Abraham to do it. He had to make a choice, to take a course of action one way or the other. Doing what God had asked of him would be a violation of his calling to fatherhood, through which he had been promised that he would become a great nation. But not doing it would be a violation of his relationship with God. God had asked him for a specific sacrifice, the one thing that he treasured more than anything else in this world. To protect Isaac would be to deny God. The cost of what we are willing to offer reflects the value we assign to God. Interestingly, Abraham did not wrestle with God over this one. He had not hesitated to boldly and persistently argue his case with God when it had been a matter of justice and mercy. But this was different. It was a matter of sacrifice, an act of worship. To try to bargain down the price this time would mean devaluing God. Abraham knew that his response to God’s request had to be all or nothing. No in-between compromise would suffice. And so without a word of protest he took Isaac along to the distant place that God led him to. He would offer this precious gift back to God. Whether God would take Isaac or would give him back, Abraham did not know. But he did know that God had always come through for him in the past. He would be faithful in this, too. Abraham laid the sacrificial wood on his only beloved son’s back and together they ascended the mountain that would one day be known as Zion. Each step of the way he wondered how it would all work out, if he would make the return journey with or without a son. But his dread of what might happen did not stop his obedience to what God had said should happen. I listened to my brother recounting the story of Abraham as the answer to his questions about obeying his own dangerous call. I knew from personal experience that we could not claim that God would spare the lives of our children, that He would protect them from harm as He had Isaac. But Abraham’s sacrificial act of willingly laying his son on the altar of worship resonated deeply with my own growing love for God. It gave significance to the risks we had taken and the losses we had endured because of our obedience to God’s call. These were opportunities to show how much He was worth to us, to offer up our love to Him. And so with tears of sorrow and of joy, I offered Him the unborn child I had just lost to dengue fever. She became my Thysia—my priceless offering.